Clemens Wenzeslaus Brentano (also Klemens; pseudonym: Clemens Maria Brentano, pronunciation: /brɛnˈtɑːnoʊ/; German: [bʀɛnˈtaːno]; 9 September 1778 – 28 July 1842) was a German poet and novelist, and a major figure of German Romanticism. He was the uncle, via his brother Christian, of Franz and Lujo Brentano. Clemens Brentano was born to Peter Anton Brentano and Maximiliane von La Roche, a wealthy merchant family in Frankfurt on 9 September 1778. His father's family was of Italian descent. His sister was Bettina von Arnim, Goethe's correspondent. He studied in Halle and Jena, afterwards residing at Heidelberg, Vienna and Berlin. He was close to Wieland, Herder, Goethe, Friedrich Schlegel, Fichte and Tieck. In his honor the Clemens-Brentano prize is awarded for German literature. ↑ John F. Fetzer, Clemens Brentano, Twayne Publishers, 1981, p. 11. 1 2 3 "CATHOLIC ENCYCLOPEDIA: Klemens Maria Brentano". newadvent.org. ↑ Father John O' Malley (15 March 2004). "A Movie, a Mystic, a Spiritual Tradition". America. Archived from the original on 2011-10-05. ↑ Emmerich, Anna Katharina. Das bittere Leiden unsers Herrn Jesu Christi. ↑ "The Dolorous Passion of Our Lord Jesus Christ". google.com. Chisholm, Hugh, ed. (1911). 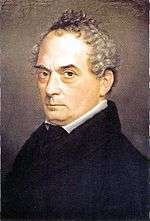 "Brentano, Klemens". Encyclopædia Britannica. 4 (11th ed.). Cambridge University Press. p. 496. Ripley, George; Dana, Charles A., eds. (1879). "Brentano, Clemens". The American Cyclopædia. Wikimedia Commons has media related to Clemens Brentano. "Brentano, Clemens". New International Encyclopedia. 1905.